RAA has developed a Survivor and Incapacitation Assistance Program to provide our clients support in the event of a family member’s death, or in the case of incapacitation where you or your spouse are no longer able to make decisions regarding your family’s finances. Our crisis team, which consists of your Relationship Manager, your CPA, and estate planning attorney will be there to assist your family when they are least able to attend to the details. While it is never easy to deal with the passing or incapacitation of a loved one, your team at RAA will ensure the surviving spouse and family members have trusted resources during this difficult time. 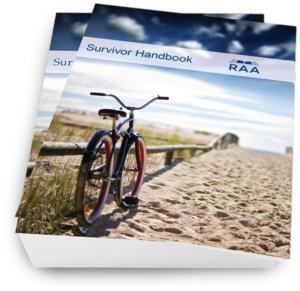 Our Survivor Handbook was designed to assist you during one of the most challenging times you may face after the passing of a loved one. While there is not an answer for every situation, we hope this handbook will assist you in getting organized, knowing who to contact for various issues, as well as provide you with basic educational information on this difficult topic.